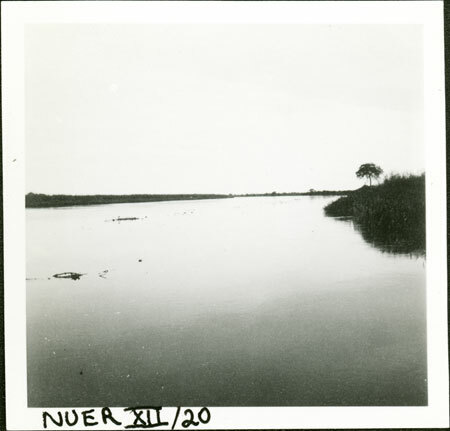 A view of a wide river, possibly the Sobat River near which Evans-Pritchard was based for much of his research in 1935. It may however also be a view of the Nile during his 1936 fieldwork. Note on print reverse ms pencil - "2" & print front border ms ink - "NUER XII/20"
Morton, Chris. "?Sobat River view" Southern Sudan Project (in development). 03 Jan. 2006. Pitt Rivers Museum. <http://southernsudan.prm.ox.ac.uk/details/1998.355.556.2/>.